In my last post I talked about the many temples of Myanmar. 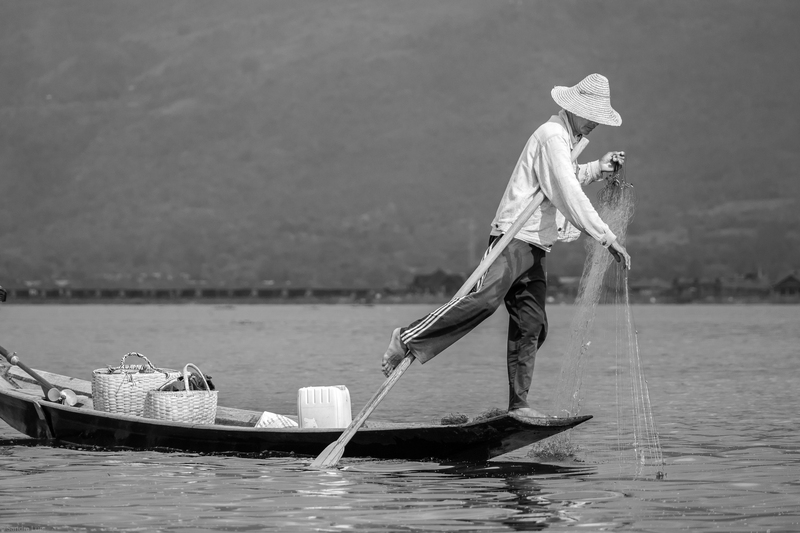 Have you ever wondered what’s it like to take these pictures? 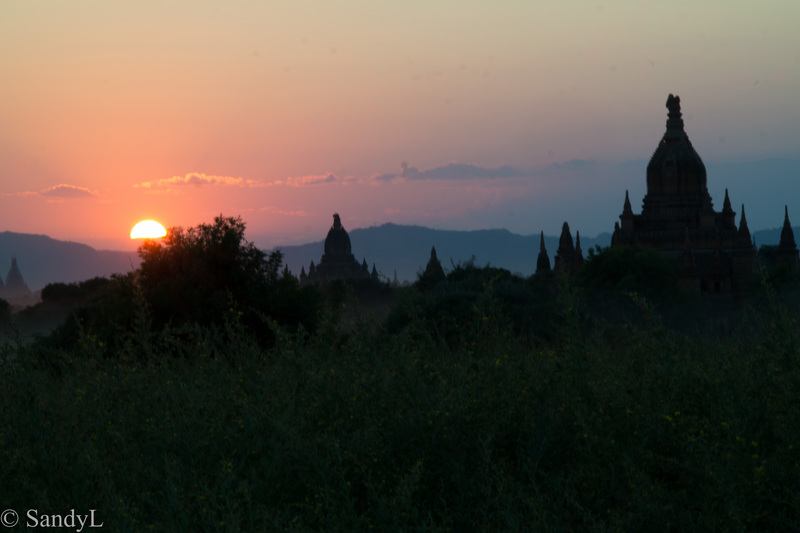 Where for instance does one go on the level Plains of Bagan to get a horizon shot? You go up of course. If you have a couple hundred dollars to spare, you take a hot air balloon ride. Or you climb to the top of a pagoda. Sometimes the pagodas have steps on the outside leading up. Other times the ascent is from within. Remember though that these pagodas were built hundreds of years ago. People were a lot smaller then. The steps and stairwells for these internal ascents are … interesting. Narrow, dark and steep best describe them. At 155cm I am not a big person but even I felt cramped in the stairwells. My size 7 feet barely spanned the steps and the sharp sixty degree rise made for a precarious ascent. The good news was that with the walls so close, I could brace my shoulders against them for support. I really appreciated this when, at one point the floor fell away to a patchwork quilt of air and brick. 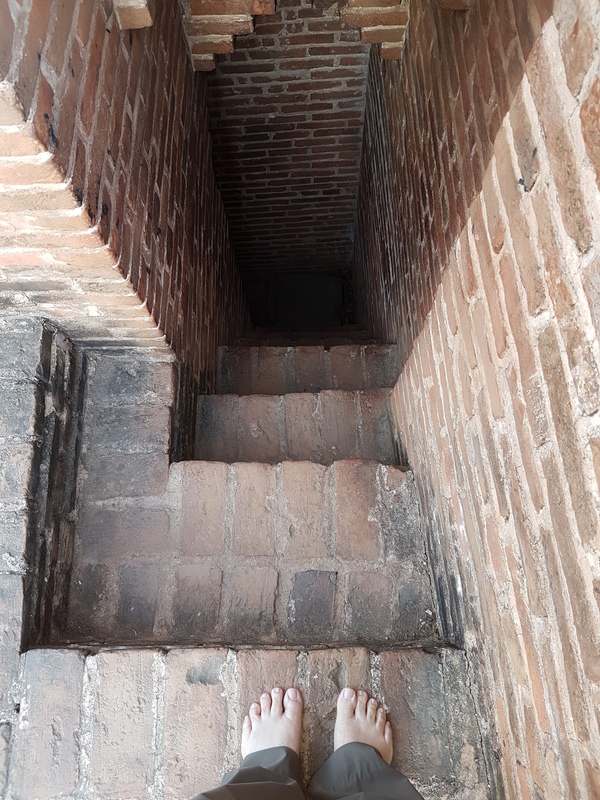 “Watch your step here,” our guide said. His tone I thought, too casual for the situation. On the way up, I didn’t take any pictures of the stairwell. I was a bit preoccupied. But here’s a picture of me contemplating the descent. 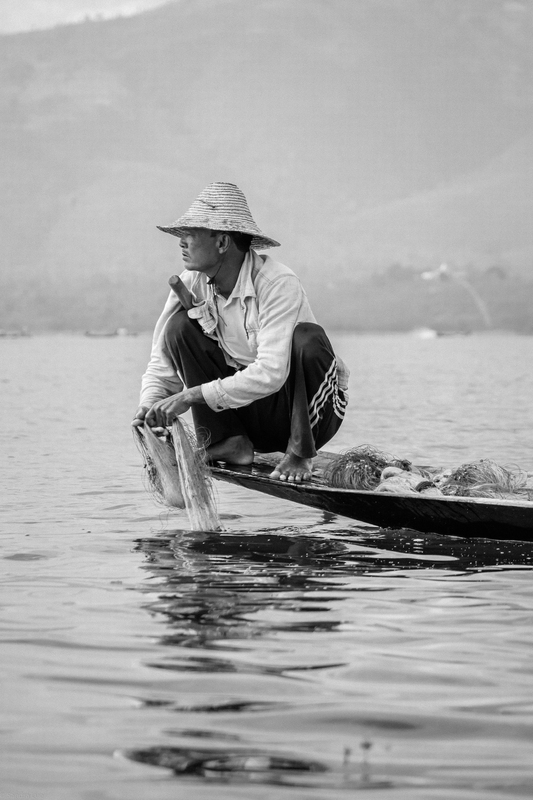 Scrolling through my Facebook page I realized that I had posted not one but five sunrise photos of Myanmar. True, the images were fantastic – that’s not a vanity, a good camera and tripod is all that’s needed – but it made me pause. What could I say about these photos that was more than the picture? What could I say about the place? 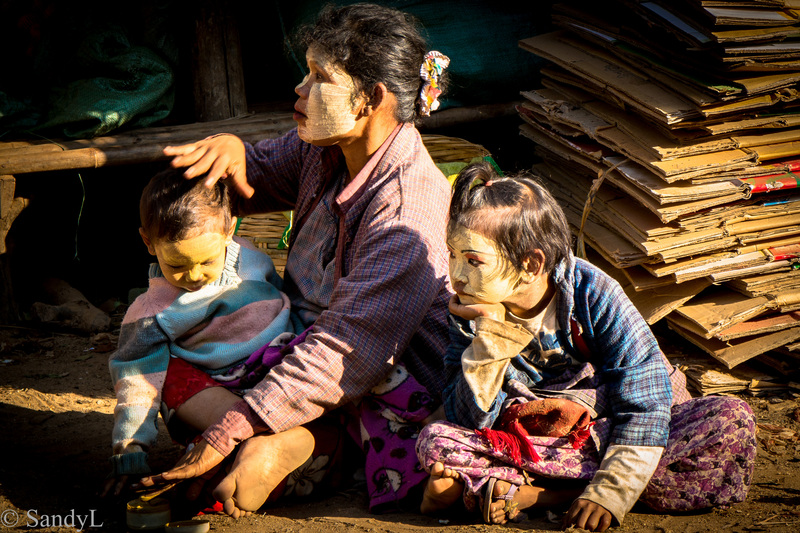 Myanmar, the land of a thousand temples. Over a thousand years ago Bagan was the center of the Pagan empire. It was a kingdom that united the regions of what is now Myanmar. Between the 11th and 13th centuries more than 10,000 Buddhist temples, pagodas and monasteries were built. The empire fell with the Mongol invasion and in the millennium that followed earthquakes, war and destruction reduced the number of temples to 2200. 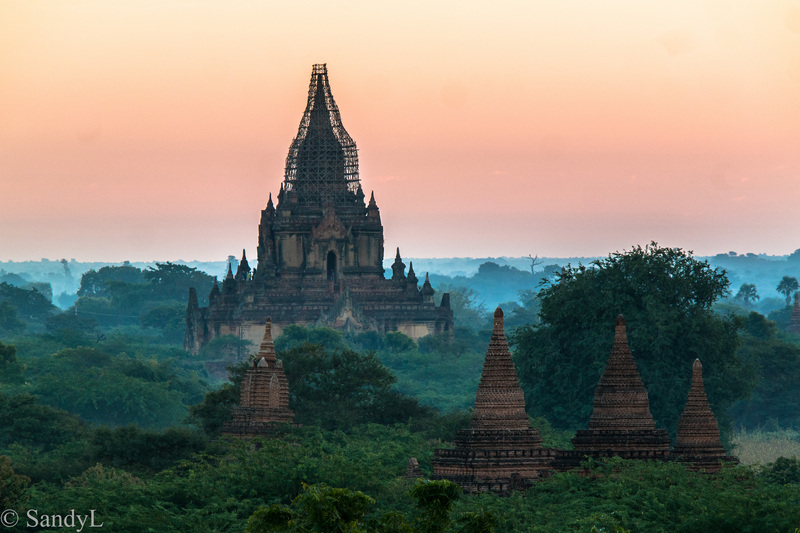 Even so, present day Bagan is the most dense location of temples in the world. Sheer numbers exceed the wats of Angkor in nearby Cambodia. Traveling through Bagan it is impossible to not see a temple. It is part of the landscape. They stand by the road ways, in villages, in single homesteads, in fields of cultivated crops and wilderness brambles. Cow herds shuffle by isolated pagodas on the way to watering holes. Goats tread on the platforms surrounding restored temples. Farmers use the courtyards to dry shafts of sesame seed bushes. The temples are venerated but common place. Ancient, old and restored. Evidence of restoration is everywhere. In August 2016 a powerful 6.8 earthquake hit central Myanmar and damaged hundreds of Bagan temples. Today many of the pagodas are under construction and restored buildings show a disconcerting mix of ancient and new facades. I asked our guide how the restorations were supervised. He replied that all of the temples are centrally managed by the Ministry of Archeology and that anyone could fund a restoration. The tribute stones at the temple indicate donor names and dedication. It was a fine answer but it didn’t address my question. Perhaps the truth lay in that restorations are somewhat supervised. Certainly more so than in the 1990’s when the military junta initially applied for UNESCO World Heritage status. They were refused, partly for political reasons but also because of corrupt management practices and shoddy, makeshift restorations The 2016 earthquake destroyed many of these faulty renovations. Today Myanmar has UNESCO support for repairs honoring archeological integrity. The new government is committed to steady and measured restoration. There is renewed hope in getting heritage status by 2018. 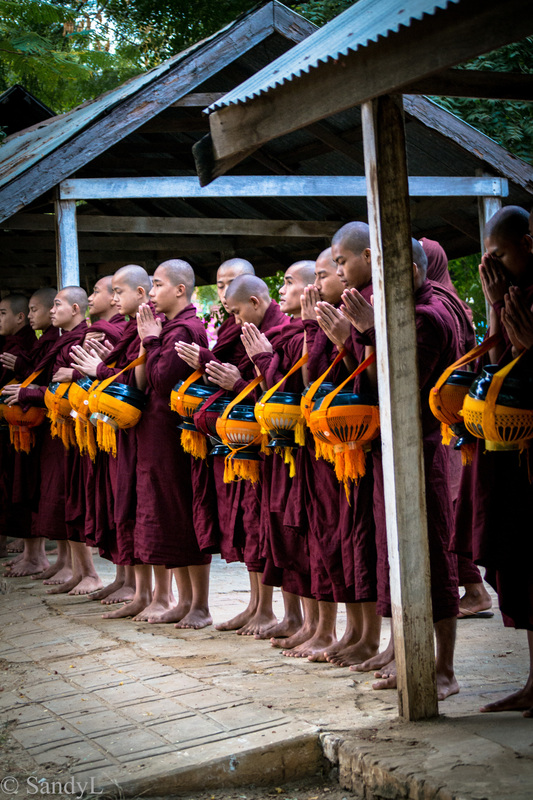 Throughout Myanmar, early morning is the time to see monks collecting food and donations for the day. Just after dawn we visited a Bagan monastery to ask permission to take pictures of the monks preparing for their morning walk. This was a particularly large monastery and the monks separated into two groups of approximately thirty each, to cover different parts of the town. Our group walked to the township, while the other went by bus to a remote location. 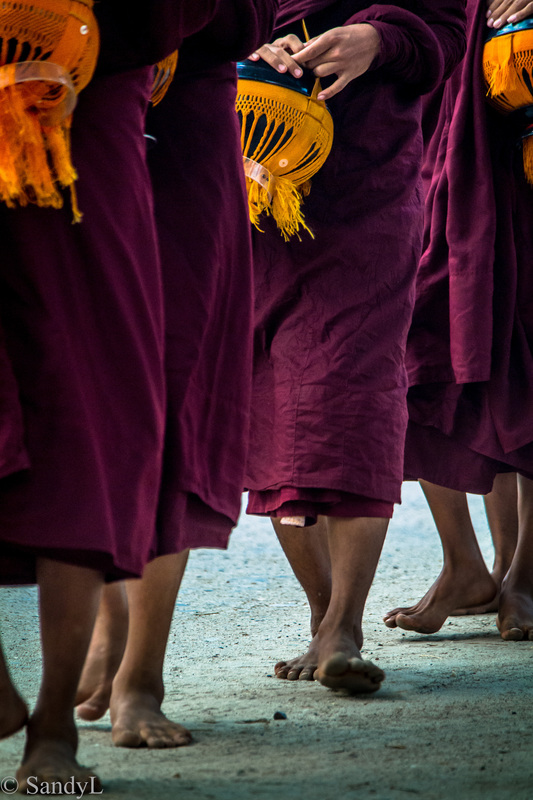 In this assembly of young and old monks, there was a sense of anticipation in the air. 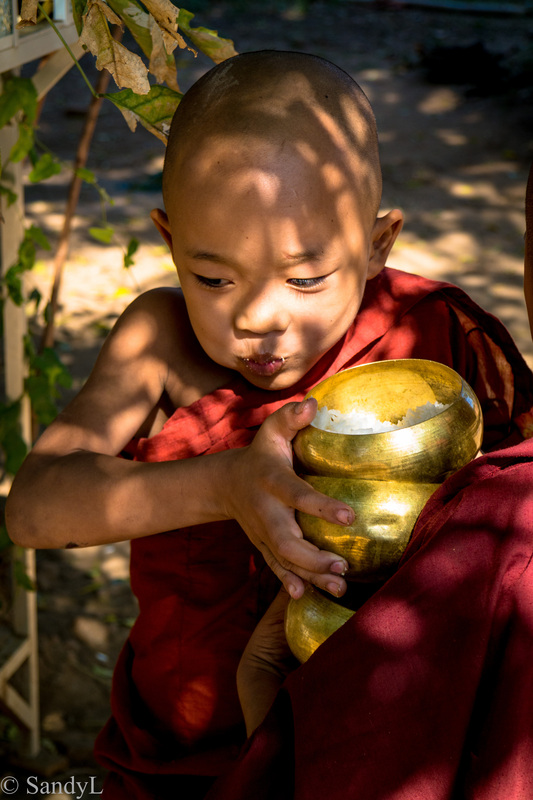 For some of the younger monks, there was even quiet levity and excitement. Soon enough though everyone settled down. After a solemn prayer they fell into line and walked briskly into town. I say ‘briskly’ because it was pretty much impossible for us to keep pace and take pictures. We had to hustle into our car a couple times and drive ahead to position ourselves. Along the roadside, residents set up serving stations in front of their homes and businesses. Here they offer cooked food, money or treats. On this day, most people served cooked rice and curry but I’ve seen them also include sundry items like laundry soap and treats like snack crackers and cakes. As you can imagine, the weight of the collection gets heavy after a few visits. Our guide told us that for this monastery, a car follows the route allowing them to periodically deposit their collection before proceeding. An advantage I think, of belonging to large monastery. 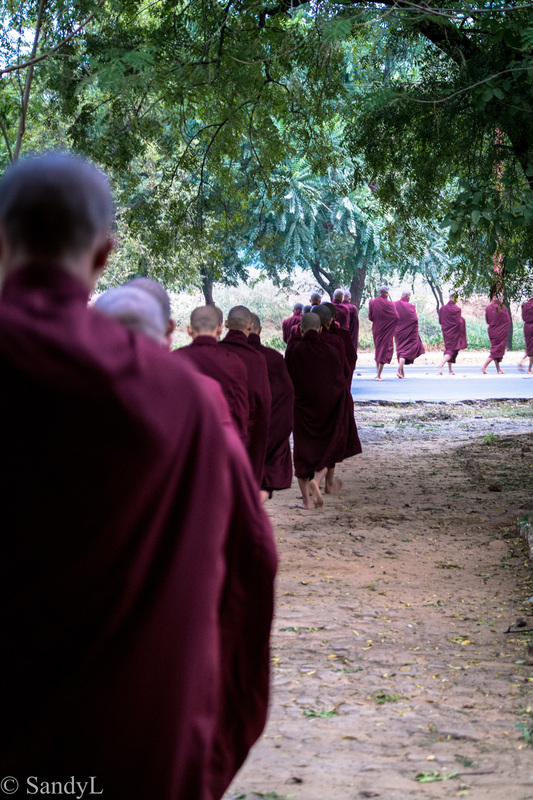 Once the route is completed the monks head back to the monastery where they’ll have the first of only two meals for the day. 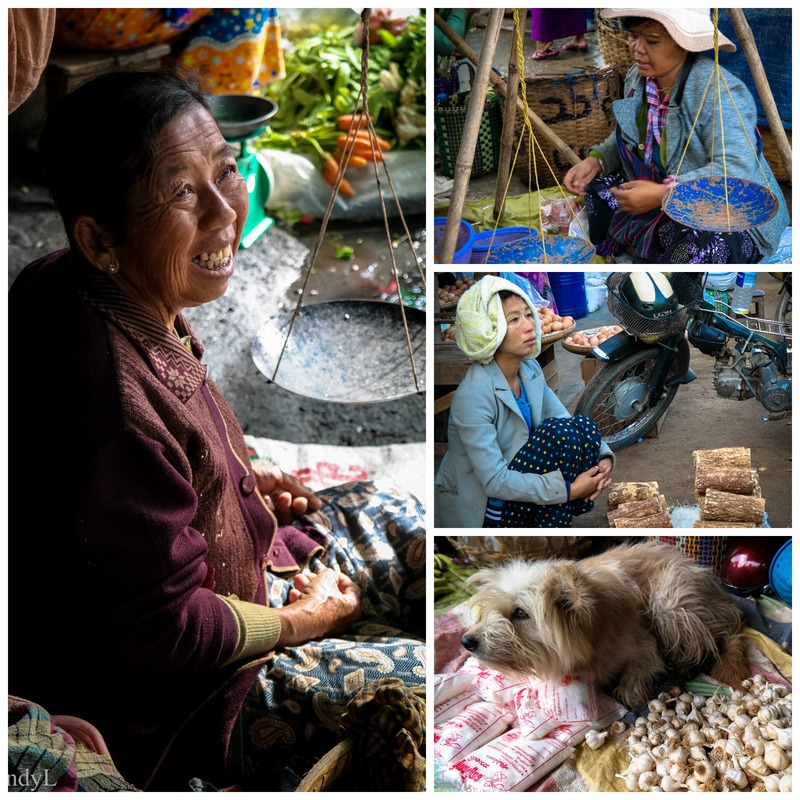 I am on the road in Myanmar, collecting photos and stories for future posts. 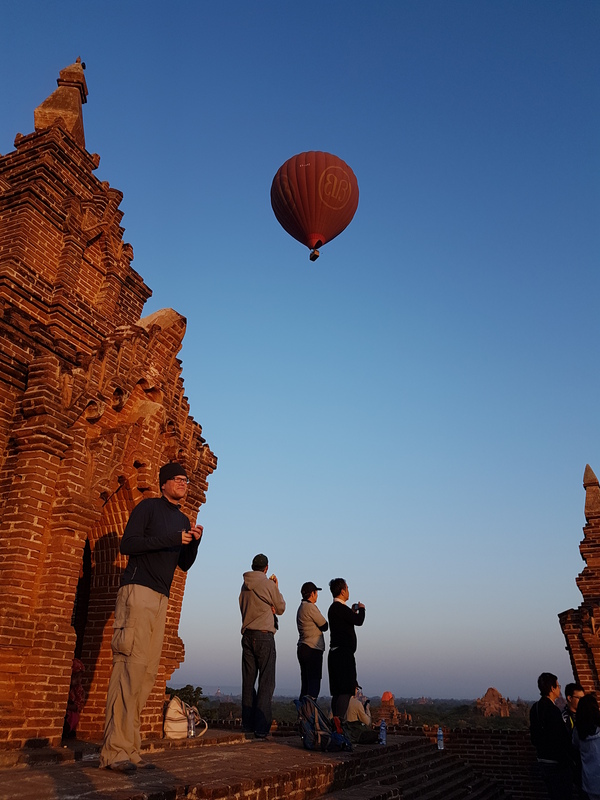 In the meantime, here’s a glimpse of the wonderful sights in mystical Bagan. Wishing you a wonderful and Happy New Year!